Last December, Anthony Levandowski—the brilliant autonomous vehicle engineer who gained notoriety during Waymo’s $2.6 billion lawsuit against Uber—announced that he was back. In a Medium post, Levandowski assailed the broken promises of the autonomous vehicle industry, arguing that it is too focused on unrealistic demonstrations of level 5 technologies and ever-more-precise LiDAR-based mapping. “Despite the vast sums of money and time dedicated to developing and rolling out autonomous vehicles, there are no real autonomous vehicles today,” Levandowksi wrote. Increasingly complex hardware sensors like LiDAR were a crutch technology, Levandowski reasoned, intended by autonomous vehicle developers to make up for the predictive shortcomings of their software. Yet Levandowski maintained his belief that true, high-performing level 2 autonomous technology could make roads substantially safer, save lives, and make highway driving easier and more pleasant. Commercial trucks are the natural place to start in order to make a big impact because they are are driven much more than passenger vehicles, up to 11 hours a day, and fatigue is a major cause of accidents. Enter Pronto, Levandowski’s new startup, which has built a level 2 after-market solution called Copilot for commercial trucks. Copilot, a software product based on cameras and radar, costs just $4,999. FreightWaves spoke to Levandowski by phone. 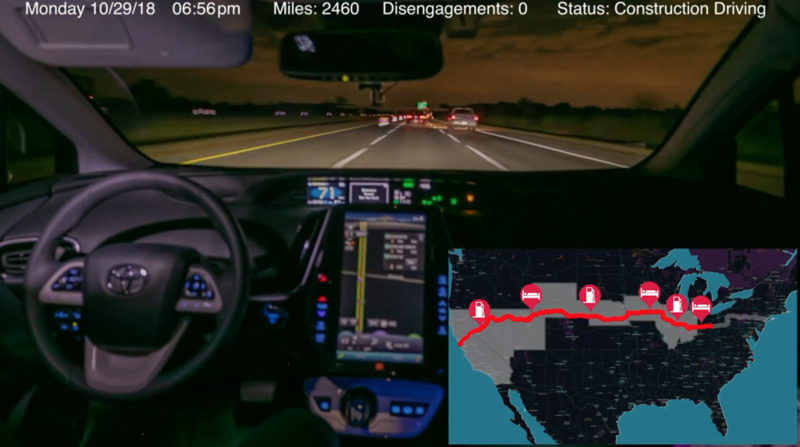 Pronto’s website includes a time-lapse video of Levandowski testing Copilot during a human intervention-free trip in a Toyota Prius from San Francisco to New York City. The key difference between autonomous trucks and autonomous passenger vehicles is that the momentum of commercial trucks moving at highway speeds means that decisions have to be made further in advance. A robo-taxi traveling 20 mph on a city street can rely on powerful sensors to detect obstacles and stop itself almost immediately. An 80,000 lb autonomous truck cruising at 62 mph needs to be able to predict the movements of objects around it. So far, Levandowski said, companies working on autonomous technology have neglected artificially intelligent intuition that would allow autonomous vehicles to imitate the instincts of human drivers. When a human driver is thinking about making a lane change, there are little cues in the movement of her vehicle, Levandowski said. Pronto is focused on training its software to recognize those cues and anticipate what human drivers will do in a given situation. Because Pronto’s Copilot is able to drive a truck for hours at a time, keeping it in the lane and controlling throttling and braking, it also monitors drivers’ eyes, face, and hands to make sure that they’re fully on duty. Video driver monitoring already exists, of course, but current systems do not allow the truck to take over—for example, to slow the truck down and pull it over onto a shoulder during a microsleep event—if the driver is impaired or distracted. Pronto took Copilot to market by approaching commercial trucking carriers first, but is open to partnering with OEMs. “We have no problem licensing our technology to OEMs because it’s a net safety positive for everyone,” Levandowski said. We finished the conversation by reflecting on the outlook for the future of autonomous vehicle technology. “It’s going to be a really long time before you have a truly driverless truck,” Levandowski said. We were unable to identify a company with a plausible, defined road map to level 4 or 5. Four years ago, Levandowski pointed out, companies working on driverless cars said they were five years away, but now they say it’ll be another four years. “No one knows” when true driverless cars will be perfected, Levandowski admitted.